Chocobo Colouring, my progression to a Soot Black Chocobo. Thread: Chocobo Colouring, my progression to a Soot Black Chocobo. While I will be basing my feed selections based on the RGB colour scale, it has yet to be proven if this is the correct method to follow. There may also still be uncertainties as to exactly which colours each feed my affect and the actual effects occurred to the other colours. Also, due to SE's ingenious idea of putting a daily limit on forum posts means there will be times where I can not reply to this thread. Hey guys, so this post will cover the progress of my Chocobo, Lanister (No, it is no relation to GoT or anything in any way, name was picked based purely on how it sounded with my own name. I realise there are plenty of threads out there already but considering the effort I have been putting into my post in another thread, found in the resources section, I have decided to devote a new thread to it. This will be updated as detailed below. My post will be broken down into stages. The main header for each section will be "Colouring #" with sub headers of "Feed #:" which will detail the food given, the amount of each, and the order in which it was given. I will also give some details as to my choice as why I selected certain foods and why I went with the order, this may vary as I may not do it at all. The next subheader will be "Update #:" which will show the results of feeding stated in the subheader it proceeds. This will usually include a screenshot of the companion menu showing the colour and the supplied image and just a small amount of text stating the colour. Bear in mind, these images are hosted on my personal imgur account and may be mistakenly removed at some point, hence the accompanying text. The following subheader will be "Conclusion #:". As this is still under experimentation and I know next to nothing about SE's implementation of the colouring system, this will be pure speculation. This will be my thoughts on the feeds and the resulting colours and will not necessarily reflect or provide fact to the currently implemented system. My aims for my chocobo is to progress through to colouring him to Soot Black. There are two main documents out there which I am using for my progress. The primary document I am using, purely for the RGB numbers of a specific colour is this spreadsheet. My secondary resource is also linked in the primary document and can be found here. My third resource is a thread found on these forums. Rather than linking to the start of the thread the following link will take you to the post I have made there which contains all the information found here. There are some minor differences though, but all information there is still provided and is located here: Chocobo dyeing R&D Thread - Post Your results here!. There was a post from this thread in particular which has been re-posted to a full thread. This contains some important information which I have been using in my experimentation. you can find that here: Chocobo Dye - The Missing Manual. Fed my chocobo today from scratch. Went red>green>blue>repeat with the darkening feeds. Fed 16 17* of each. Will come back with results and screenshot to this post when I have them. *I fed one extra of each because I logged out and back in and wanted to see how long was left before the chocobo was going to change. Hoping to go for black. Checking the given resources, another user has claimed to have given their chocobo the same colour with only 10 of each feed. This would lead me to think that perhaps colouring can be decided on a ratio of the foods given. However, given the number of colours within the game, I would be inclined to believe that there would also be a minimum number of feeds to be given, or a range, to obtain a specific colour i.e. 1-8 of each fruit given may give colour X, while feeding 9-17 may give colour Y even though the ratio of feeds are the same. This is due to the same resource claiming another player feeding 5 of each of the fruits, in all cases the fruits being only the darkening ones, yielding a different colour. Next feed is 10,8,1 of the RGB darkening feeds respectively. I took the difference of the values of this colour and soot black and took a ratio of feeds. The difference was [122, 90, 12] so dividing each by 12 gave me the 10, 8, 1 of the foods. Going by my last attempt, the foods didn't change the values proportionally but are getting me closer now with a difference of [98, 46, -7]. I did go for a 2:1 ratio on the red:green darkening respectively considering the difference for red:green from the soot black is 98, 46 respectively. Although, the Blue is -7 from soot black, I may need to feed a blue lightening one but will see how this turns out. Results will be back in less than one hour. This is a lighter shade of red than the previous colour which is odd considering I feed only darkening feed. Blue has risen slightly, which is good as it is closer to soot black. Green has gone down slightly. The differences this time between the blue of Blood red and that of Soot Black has changed without any use of feeds stated to change blue. This may mean that in order to darken one of the specified colours, it compensates by lighting two more. That, or the number itself may not have changed at all but rather the game has designated the nearest colour based on the numbers of my chocobo's RGB values. Once again, thanks to Zuro, Zuro Tha'leus of Behemoth, for referencing this post* as I would have missed it and even more so thanks to Syrehn, N'yuuki Nekohmi of Gilgamesh, for providing the information. I am hoping this will work. *This post was remade into a full thread which is also found in the resources. Please be sure to read the entire post, I cut it down because it was fairly lengthy to quote it all here. The top row of matrices summates all the work done thus far and the current colour listed as "New Colour" in the top row of matrices. These same values are referenced in the "Current Colour" matrix along the bottom. More detail on the Influencing Factor can be found in Syrehn's post. The positive and negative effects of this factor have been accounted for in the cell equations and the number can be adjusted according but would effect all work done. I had considered leaving this at 5 for a rounded mean of the range. There is no particular reasoning behind this however, when adjusting this number, using 5 seemed to give a more accurate RGB code for Blood Red which is the current colour of my chocobo based purely on observation. The "Desired Colour" in the bottom row is that of Soot Black. By determining the difference between the current and desired colours, I could easily compare this to the "Total Adjustment" which is the changes to the RGB code base don the feeds. As can be seen, the "Total Adjustment" is on the left side. For the top row, I work from left to right. On the bottom row though I take the middle matrices to give me the difference which is on the right and then manually adjust the number of feeds (located on the left) and compare the "Total Adjustment" to the difference until I get what I consider to be a reasonably close match. The issue that arises here is that I am still using a constant "Influencing Factor". As I have yet to actually plant new seeds due to other members wishing to colour chocobos too, I have time to consider using an Influencing Factor of 5 or keeping it at 6. A lovely Russet Brown, it just rolls of the tongue. 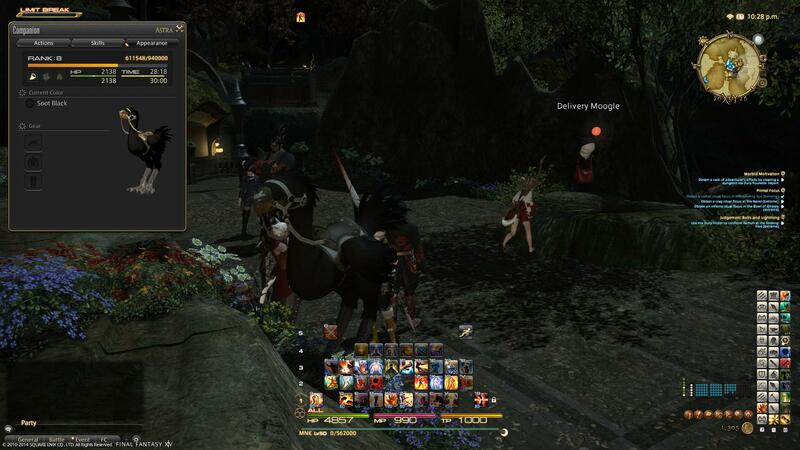 Congratulations to Zuro, Zuro Tha'leus of Behemoth, on his soot black chocobo! I don't quite remember how I got from blood red to loam bown, but after getting Loam Brown feed it 2 berries, 1 Pear to Deepwood green. From deepwood green, 1 Valfruit to soot black. Last edited by Barboron; 08-29-2014 at 01:39 AM. Thanks for posting this. 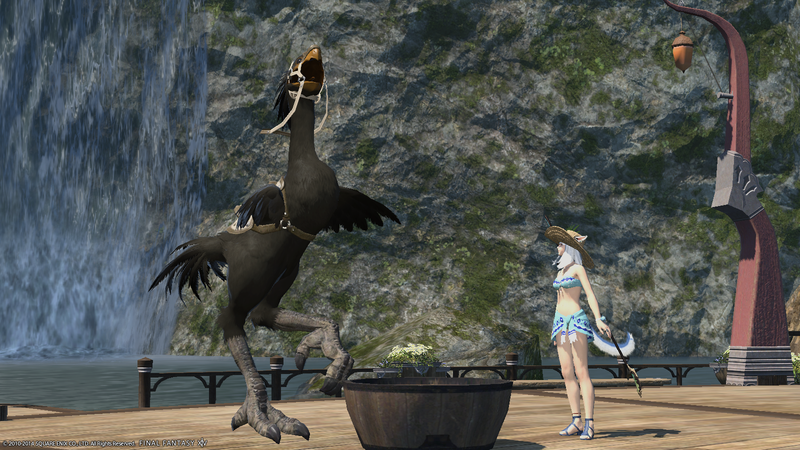 I'm waiting for someone to discover the soot black chocobo since I'm planning on making mine that color. Happy to help, hoping others can share any progress they have made to obtain soot black or any grey colours. I don't have the gil for buying food, so I'm just trying to help out with brainstorming. But I would love it if someone tried this and report the findings. The issue with this is, that we don't have a jet black in this game so there is still some colouring in the black. Using this converter for simplicity, the black in hex should be #25231E. So, my Blood Red (#8B3422) to Soot Black (#25231E) is a difference of (in decimal, using this calculator) R, G, and B. That's a lot of food but if I go by ratios again it's 26R:4G:1B feeds so I may try this but it will take some time to get the foods as I am all out, garden is full, and will not be purchasing them. Last edited by Marxam; 08-24-2014 at 04:43 AM. Thanks for the work. I personally am looking for blood red and you achieved it. Thanks. There may be easier ways to go about it. Also, from the conclusions, you can see that you may not need the amount of food that I have used, it could be excessive. I am also under the impression that there may be some RNG behind it. As far as I know, your chocobo's feathers won't change colour until you feed it enough times to get the message stating your chocobo is growing new feathers. I can't say for sure if the feeds before this message showing do or do not have any effect on the colouring but it seems some people are having this message show after a different number of feeds. Also, check the first resource as someone has obtained Blood Red directly from Dessert Yellow. This will save you going through stages, hopefully. I fed those from having an Acorn Brown chocobo so it may not necessarily work from a Desert Yellow chocobo. Again, check the first resource listed as it gives a set of snacks to feed to go from Dessert Yellow to Blood Red. Let me know your results if you take this, would be nice to confirm if feeding the same foods will give the same colouring. Last edited by Barboron; 08-24-2014 at 04:58 AM. Yes, I just realized it does indeed still have color in it. Back to the drawing board, haha. Are you using the color spreadsheet? I think someone mentioned in the other thread the RGB numbers are off in that. Either way, I'm hoping to try getting gray first and work from there. Yeah, using that spreadsheet as a rough guideline, the primary resource. I was thinking about going grey first but it seems the feeds don't darken the colours at the same rate so while you might get grey, I would doubt you would still get black if you did a 1:1:1 of darkening feeds. Updated with a results section. Thanks to Zuro for sharing.